1.….it is not Rare to hear/read… sentences like ……. you are offering Hanafi/Shafaee Salat and I am offering Muhammadi (SAW) Salat ……….. 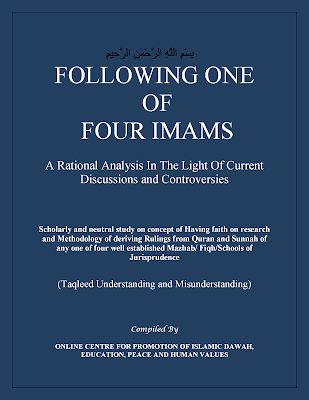 Following an Imam is akin to Shirk………..
What was Muhammad (SAW) Either Hanafi/ Shafaee/ Maliki/ Hanbali?? and it finally reaches for OPEN ABUSE sometimes in words that what to talk about muslim a shareef Non Muslim will also not used. Wallah Where MUSLIMS have reached ?????? 2……..These are not only unfortunate cheating and mislead but also one of the greatest fitnah of our time……. 5.……It is also setting a very dangerous trend of attack and counterattack in ummah as in the era of free internet/ you tube/face book/Islamic Forums you cannot conceal the truth/tell a lie for long………. Whosoever is reading this book please approach to the Ulema/Scholars /Influential people in your contact attached with any group and draw their attention about what is going on on Facebook/you tube. Request them to do something Positive at different level for solving this menace. Requesting for Dua for Whole Ummah . We acknowledge all the Ulema of past and present whose writing gave input for the work. 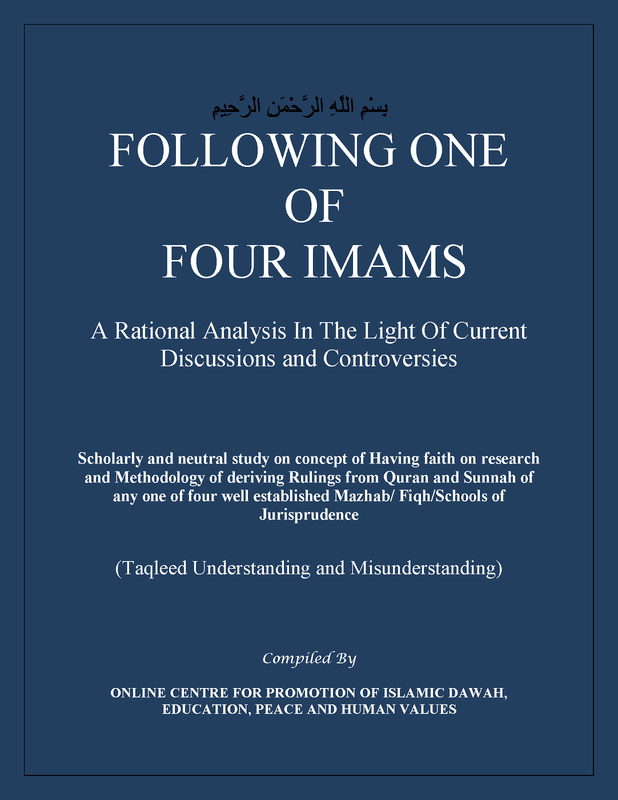 · Is taqleed/following imam is in whole deen/ every aspect of islam or in Just nearly 5 % issues in detail of Fiqh?????? · Is it a rope in your neck and other end is in imams hand?? · What about claim that imam and their associates were not knowing the ahadith???? · Islam is the guiding source for all spheres of life not only in salat and saum etc but in offices ,business, running share markets,and running a country and coutless other affairs. · Is it a handicap situation of dependency on imam/jurist or a divine arrangement???????? · What a layman should do. · Salafus Salehin Advices on the Following one of Four Imam.